If you are planning on photographing the Northern Lights you will need to carefully consider the equipment, camera settings and composition in order to truly capture this natural wonder. At first seemingly complex, once familiar with the basics, photographing the Northern Lights is both easy and a lot of fun. So where do you start? Firstly, make sure you have the right equipment for the job. You don’t need to invest in expensive or professional gear but you may find you require more equipment than you usually use for your standard holiday snaps. It is important that you are able to adjust the ISO, aperture and exposure time to photograph the Northern Lights. Any camera with a manual mode will give you this control and a DSLR is recommended. A DSLR is likely to have a larger frame and a higher ISO capability which will reduce noise (visual degradation) in your photos. The added benefit of a DSLR is that you can also change the lenses. And if you are looking to invest in any equipment for your Northern Lights photography this should be where you focus your budget. A lens with a fast aperture is ideal. A fast aperture allows more light into the camera reducing the amount of time it takes to capture a photo. A wide-angle lens (around 24mm) is also preferable for capturing the scope of the landscape. A tripod is as essential as your camera when photographing the Northern Lights. You will be taking photographs at slow shutter speeds and it is important to avoid blurring the image by having a sturdy tripod to support your camera. Similarly, a remote trigger or cable release for your camera will allow you to take photographs without touching the camera body and avoid any unwanted vibrations. 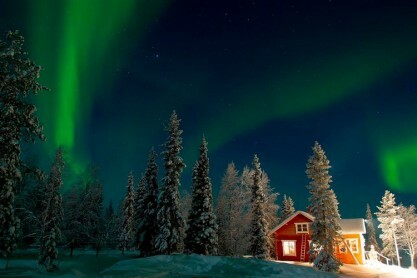 Don’t forget to bring spare batteries with you to Lapland. Batteries drain especially quickly in cold temperatures. Have at least one spare camera battery with you or run the risk of not being able to turn your camera on! While concentrating on all the necessary camera equipment it can be easy to forget to pack appropriate clothing. It is important that you keep warm and the more layers you wear the better. I can recommend from experience investing in a pair of fingerless or silk liner gloves so you can continue to make fiddly adjustments. Your camera equipment is pretty useless when you have no feeling in your extremities. A head-torch is also required for changing settings in the dark and low light. So you’ve got the equipment – now what? There’s no automatic way to shoot the Northern Lights. Everything will need to be set to manual, including disabling your flash. Knowing what camera settings are required to capture the Aurora Borealis can appear confusing at first but is actually fairly simple. Start with manually focusing your lens; auto-focus should be switched off as it will struggle to fix on the Northern Lights. Like the moon and stars, the Lights are some distance away and you may get away with setting the focus to infinity. However, this will not always give you the sharpest image. It will be best to base focus on a far away object on the distant horizon. The ISO adjusts how sensitive the camera sensor is to light. As you’re shooting in a dark environment this setting will need to be kept high but not too high. Higher ISOs tend to lose image quality to noise. Aim to shoot at around ISO 400 to ISO 800 where possible. Increasing the ISO should only be considered when the aperture and shutter speed are at their maximum and yet the image is still too dark. Open the aperture on the lens as wide as possible. This will depend on the lens you are using. Aperture f/2.8 is optimal but you should also get away with f/4.0 with longer exposure times. The next step, selecting the shutter speed requires experimentation. You should aim to keep the shutter speed between 5 – 30 seconds. Consider how quickly the Northern Lights are moving across the sky, you don’t want them to become blurred. If the Lights are moving quickly keep the time to between 5 – 10 seconds. It is recommended to shoot your photos in a RAW image format rather than as JPEGs. This retains more information on file and makes the photographs more suitable for editing at a later date. Your kit’s all set-up and you’re ready to shoot. When photographing the Northern Lights carefully consider the composition of your picture. Avoid shooting just the sky. You will naturally want to make the Lights the focus of your picture but this risks becoming a boring image. Try to include aspects of the surrounding scenery such as trees, hills or a log cabin and use these to frame the Lights. This will add context to your photograph as well as showing the scale of the sweeping, colourful ribbon of light that is dancing across the sky. Perhaps the greatest tip of all for photographing the Northern Lights is to put away your camera completely. It is far too easy to become obsessed with getting the perfect photograph and miss seeing the spectacle with your own eyes. When viewing the Northern Lights for the first time (or second, or third…) make sure you take the time to stand and stare. The display in front of you is one of nature’s most amazing wonders – make sure you give it the attention it deserves. With or without your camera. If you have any questions or suggestions, drop us a line.